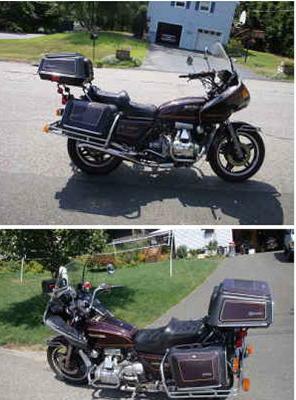 The 1981 Goldwing GL1100 for sale is a naked 1981 Honda Goldwing GL1100 and I also have another one for sale that is a a full dresser 1983 Goldwing GL1100 (vetter bags). The Wings both have around 40,000 miles on them and have not been cranked in a few years. I can answer any questions that you may have if you will send me an e-mail using the address found directly below in this classified(and don't forget to mention that you found this ad on used motorcycles for sale gogocycles.com) in your message. GoGoCycles would like to invite our visitors who are having problems with their own 1981 Honda Goldwing to leave a description of the problem that you are experiencing to see if somebody can offer a solution or give share some advice on how to fix your motorcycle (and DON'T FORGET to leave your contact information in case they need to get in touch with you). If you are having trouble finding 1981 Honda Goldwing parts, you can post what it is that you are looking for that you need to repair your bike. AND it would also be helpful if you would write a review of the Honda for sale if you have knowledge to make others aware of any problems common to this bike or to list its positive features, make recommendations for desirable accessories or anything else you think we should know. The 1981 Goldwing GL1100 for sale is located in Plainville CT USA and any reasonable offer will not be refused for either motorcycle. For more information either call me (no e-mail)at 860-7nine3-22seven8 and don't forget to mention that you found this ad on GoGoCycle's Used Motorcycles for Sale . Join in and write your own page! It's easy to do. How? Simply click here to return to HONDA GOLDWING CLASSIFIED INVITATION.